I used to work in the violin shop. My favorite part of the job was when parents and their kids would come in and get fitted for violins, violas and cellos according to which instrument tickled their fancy. This always makes me giggle because there are very few musicians who wake up one morning and realize they can play an instrument brilliantly. Most of us just spend hours upon hours practicing to get there. 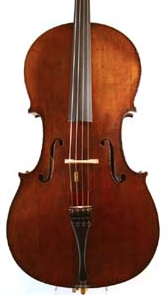 I remember though, there was this one woman in particular who bought what I thought was one of the most beautiful cellos I’ve ever seen. She was buying it for her daughter who was going off to college and was just picking it up the day I was working. While she was waiting to pick it up I said “this is the most beautiful cello, your daughter is going to love it.” She told me that her daughter was in college out of state and that she was tempted to start playing the cello herself. She always dreamed of playing but thought she was too old to pick it up now. I told her that was nonsense and that you’re never too old to learn something new. I gave her the name of a great cello teacher and encouraged her to give him a call. Months later the same woman showed up in the shop to get a tune-up on the cello. She told me that she had taken my advice and started cello lessons. She loved her teacher and loved playing so much she was going to buy her own instrument. She also found others her age and ability to play with and though she’ll never be the next Yo Yo Ma, she was having the time of her life. Playing music isn’t about being the best. It’s about enjoying the process. There are very few people in which music comes easy. Playing any instrument takes time, practice and perseverance. And really, anyone can do it if they have the drive. It doesn’t matter what age you are, it’ never to late to try. Want to be the first to get my lastest post updates? Just fill out the form on the top right to subscribe.